Equities start the day lower as we continue to punt stocks. Speaking on punts, did you see what the Bears did on Sunday? Of course you didn’t because no one wants to watch the Bears. They punted on every drive. All of them. Is it bad when the Cubs are your only hope in October? Since my sporting world has been turned upside down they may as well turn my investing world upside down too. Wait…they did that already? Great, maybe I’ll get a razor blade in my apple on Halloween. Misery abounds my friends but I’m not going to let it get me down! Life is a precious gift, so I wake up each day with a smile on my face and trundle off to Baird to try and brighten someone’s outlook (no one is buying this are they). Speaking of no one buying have you see Biotech stocks? Talk about a pain trade. The sector was up as much as 30% in the summer and now it’s down on the year. The optimist in me thinks that corrections are over when the takeout the leaders but this one doesn’t feel anywhere close to being done. Watch credit…I’m serious. Watching credit in 2007 was key because it led pretty much everything lower so at least you had a heads up. High Yield was getting pummeled this morning but Investment grade kinda hung in there so it wasn’t total carnage. If you need places to watch this hit me up on email and I’ll send you my favorite metrics. Punted on every down…a worse outcome than that England rugby match (that one was brutal). After the open it was uninterrupted selling from the ding dong. Glencore, a name that doesn’t get a lot of press on Main St USA, is rapidly becoming the poster child for the Great 2015 Shellacking. A giant leveraged materials/trading conglomerate quivers as their stock plummets and their CDS levels soar. Does that statement remind anyone of anything? This is starting to feel like the real deal Holyfield isn’t it? Biotechs like VRX got pummeled again but to be fair, so did everything else. The CEO of VRX even put out a letter defending his share price. Welcome to the party pal. A few hours into the day we were down 2% and it felt like 3% was in our sights. The biggest winner was Alcoa, AA, after they announced they’d split the company in two. Wait…if they split the company which one of the new entities will kick off earnings season? This is important; I hope the bankers put some thought into that. Also please don’t name it something dumb like alphabet or mondelez, get creative this time Kellogg grads. Other winners were TAP and RAI. Beer, Cigarettes, and a corporate restructuring situation…the apocalypse is upon us and apparently bankers will be the new Mad Max. You wanna know how dire this market has become? You can’t even hide in something like Mead Johnson (MJN) anymore. They make baby food for crying out loud and the stock is down 30% YTD. Where can you hide? Right now in places like ATVI, AZO, CMG, and SBUX but if this market really has topped out you’d think they would be in the bear’s sights. By lunch it was a pure misery fest of selling heaped upon selling, 1,890, down 2.3%. But…..I thought … you said we were ok spider? No you’re definitely not ok spider. The afternoon saw a speed bump of a bounce that got bulldozed and by the end we had lost this month’s mortgage payment. Down 2.5%...felt exactly like this. You would think we’d get a massive face ripping rally given all this negativity right? If it does come you have to stay away from it…. big meaningless rips can occur in strong downtrends. The upside isn’t clear until we break 2,000 so keep your eyes focused there. Credit is absolutely worth watching as is the fate of companies like Glencore. The market senses blood from leveraged companies, if things settle down in credit they should start to settle down everywhere else. Doesn’t mean we are out of the woods but it means that the disease probably won’t spread. Interesting times my friends. Final Score Dow -191bps, S&P500 -256bps, Nasdaq -304bps, Rus2k -287bps. Succinct Summation of the Day’s events: A giant company that personifies the commodity boom is getting killed and it’s reminding us of darker times. 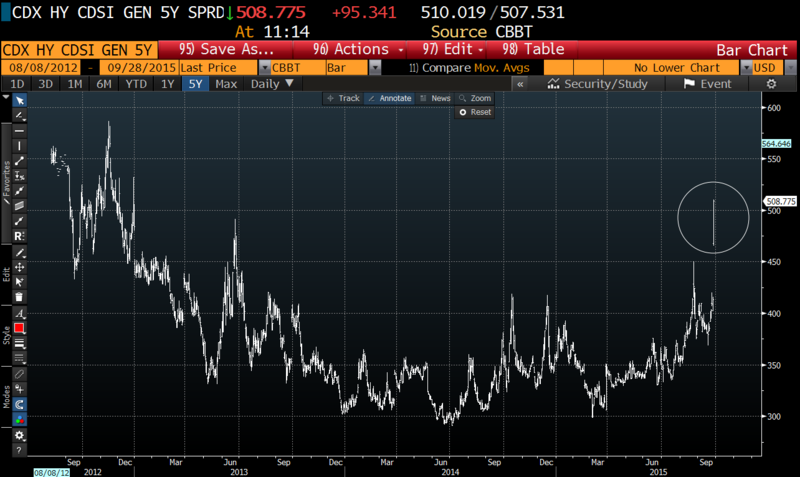 Credit is quivering a bit and price action is horrendous. Speaking of credit, this author wondered whether its panic time (not yet): As you can readily tell, while credit is “agitated” these days, in the big picture the widening of spreads is well within the range of the random ups and downs we should expect from the credit markets, and markets as a whole. Things you see at the top (from BI): SalesLoft, an Atlanta-based startup that makes software to help salespeople sift through their leads, knew it had to do something a little different to stand out from the crowd at the conference. The first part of SalesLoft's plan was to create a fake presidential campaign for Salesforce CEO Marc Benioff. The second part was to use cash-shooting guns, originally intended for bachelor parties and the like, to literally shoot wads of slogan-stamped $2 bills — which exist and are legal tender — into the streets of San Francisco. Shooting cash into the street huh? What’s the IRR on that? So many Bears! So many! And they love punting! Bearishness has reached an extreme not seen at least since the top of the Internet bubble in early 2000. Can you say “oversold”: Today we look at two breadth indicators, both of which have given a buy signal only 10 times in the last 20 years, majority of which were very reliable several months afterwards. 10 Qualities that lead you to unhappiness. Awesome article, read this one. I’m going to try and focus on #4 and #9. #9 is just brutal, have to change it.